Two explosive missions...One unstoppable team! When liberty is threatened and innocent lives are at risk, the U.S. Army's elite Delta Force charges into action! Chuck Norris delivers his unique brand of martial arts mastery and hard-hitting heroism in two unforgettable missions where only the strongest will survive. In The Delta Force, political extremists have taken innocent people hostage...and only super-soldiers (Chuck Norris and Lee Marvin) can rescue them. 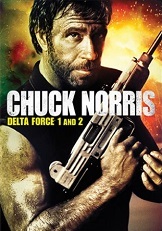 Then in Delta Force 2, Norris returns as commando Scott McCoy on a daring mission to destroy a deadly South American drug cartel.